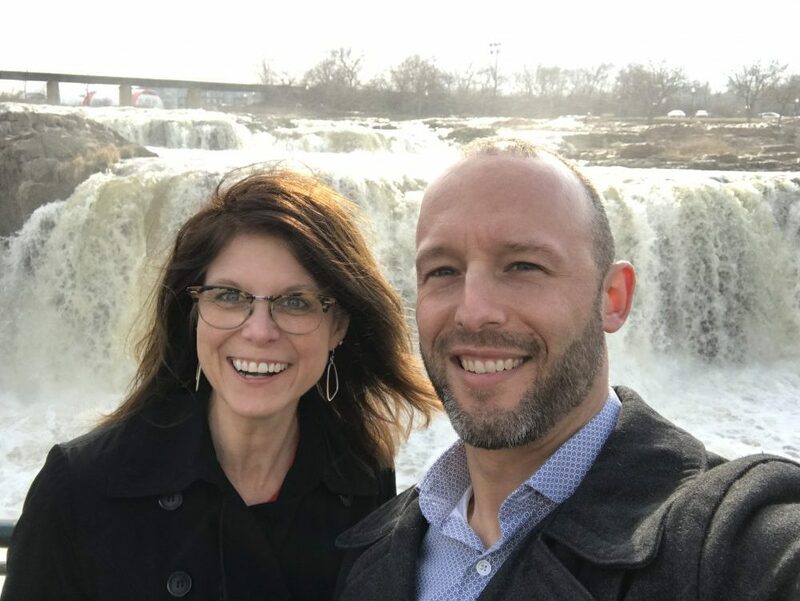 Peak Consulting LLC recently visited a bank in Sioux Falls, South Dakota and was able to learn a little about the exciting city as well! The history of Sioux Falls revolves around the cascades of the Big Sioux River. The falls were created 14,000 years ago during the last ice age. The first documented visit by an American was by Philander Prescott, who camped overnight at the falls in December 1832. The first four-door automobile was invented in Sioux Falls. An average of 7,400 gallons of water drop 100 feet over the course of the Falls each second. At Falls Park, which includes 123 acres, you can find the walking/biking trail that can take you all around the city. The South Dakota Battleship Memorial reminds us of the battleship USS South Dakota and those who served aboard it. Located here is the Great Plains Zoo and Delbridge Museum which include 1,000+ animals including leopards, tigers, rhinos, monkeys, and more. The Cathedral of Saint Joseph is more than a place of worship-it’s also a civic landmark that you can tour. The Veterans’ Memorial Park is a peaceful and pretty spot to reflect and remember. Wild Water West water park is the largest in the entire state and has a lot of fun activities. The Earth Resources Observation and Science Center is a very remote research and data center for the U.S. Geological Survey and the U.S. Department of the Interior. 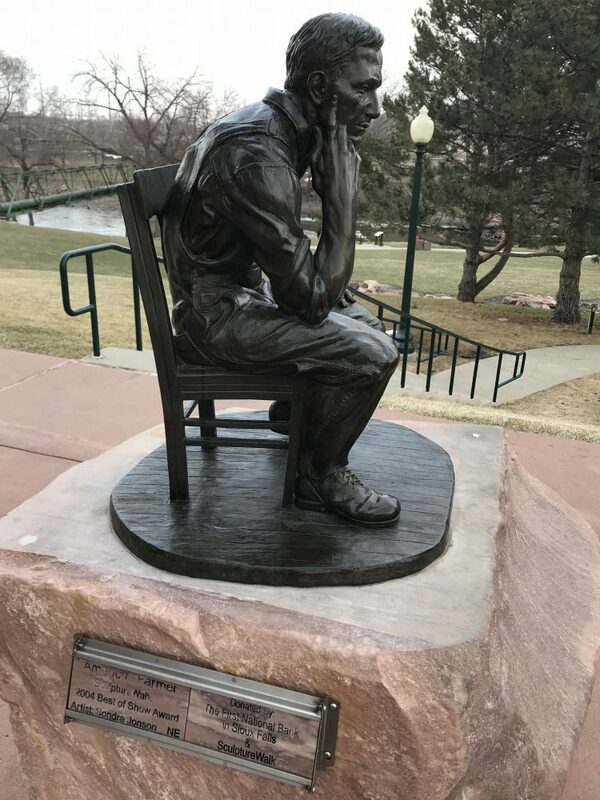 Though it’s not exactly the real thing, the full-size statue of David in downtown Sioux Falls is one of only a few bronze castings from Michelangelo’s original. Over 800 living butterflies winter in Sioux Falls at the Butterfly House and Marine Cove tropical conservatory located in Sertoma Park. Sioux Falls headquarters one of the largest outdoor music festivals in the country- The LifeLight Festival. 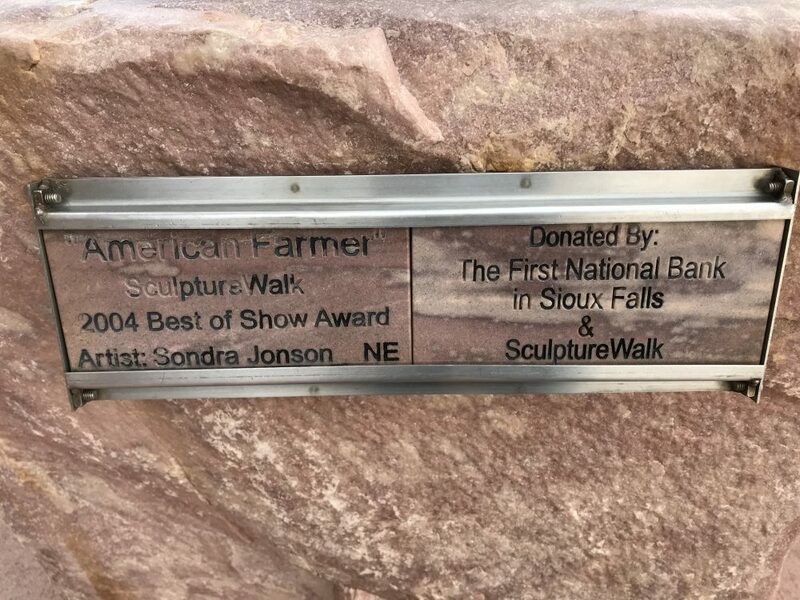 Brent and Susan specifically liked the statute of the American Farmer (picture below), which was made by a Nebraskan artist and donated by First National Bank whom we consulted. Sioux Falls is absolutely beautiful and makes for a very enjoyable trip! Peak definitely recommends visiting.